These simple return address labels were designed to coincide with one of our more popular personal check products. Safety checks are a traditional choice featuring a basic design. Now you can enjoy that same simplicity on a classy set of labels. It's a great way to color coordinate your office supplies and give your mail a professional finishing touch. But sharp-looking styles is only one of the big benefits. You'll be pleasantly surprised to discover how these labels make your life a little easier. That's because they are self-adhesive. You just peel and place them on all your outgoing mail. 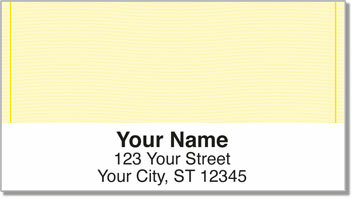 Order your very own Multi-Color Safety Address Labels today! This selection can also be found in single colors.